More about mounts--Absolution Tower comes! Time to get skills for mounts! Time to collect more mounts! 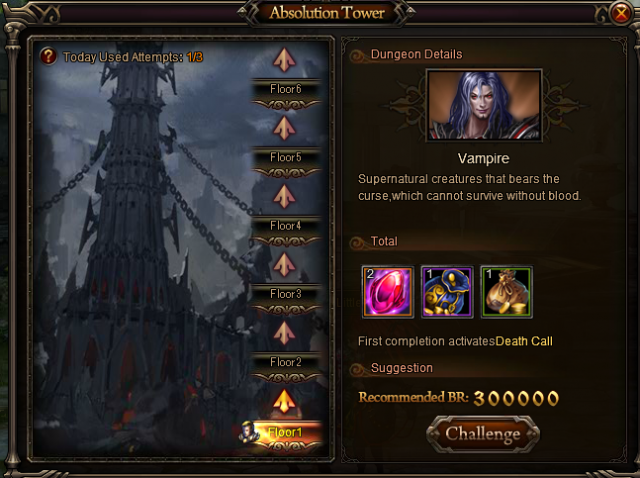 Simply refresh the page and find Absolution Tower. Now time to be a better mount trainer! OH JELLY...this looks like an awesome feature. Kuddo\'s to the DEV team on this one for sure. A very nice way to increase your mount and Char at the same time.. sweet. 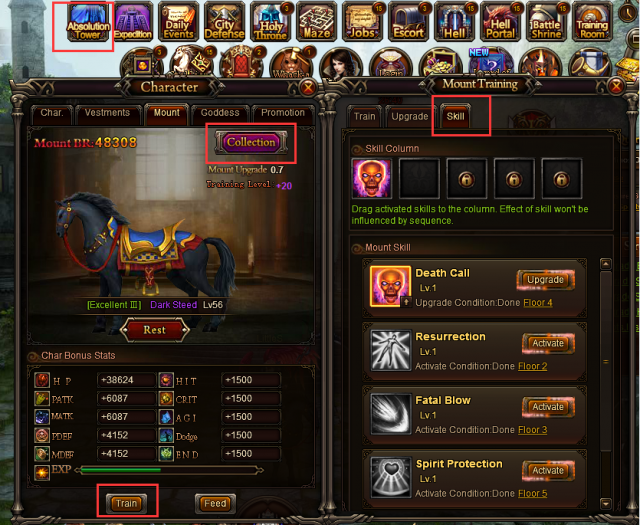 I would like to suggest this...at the bottom of your screen could the DEV team add a mount icon beside your Char one..there plenty of room and with all the new thing to do with mounts..it would be nice to go straight to them..instead of though your char icon. Otherwise I cant wait to run it a few days and see what its going to tke to climb within the tower....for sure. Thank you again Dev team! Will kindly request for the right amount of BR recommendation for each floor. 7th Floor recommends a player with 2.4 M BR but I myself with 3M Br higher results Defeated in battle. Either change the BR recommendation or nerf the Mobs on the ascending floors. Overall the Mount skills/Buffs are a game changer. hey about the new Absolution tower it is nice to have some why to upgarde you mounts skills..
when that have been said i can not beat lvl 3 and it says that 600k BR is need it and i have 1.200.000 BR that can not be true that i can not kill it.. maby there is a bug there.. please look in to it..
it is an awsome update, but i have problems when i come to floor 4. My;br is 1.316.875 and the monster i compete with have 900.000 in Br, why cant i beat it? 2019-4-19 23:10 GMT+8 , Processed in 0.062400 second(s), 52 queries .